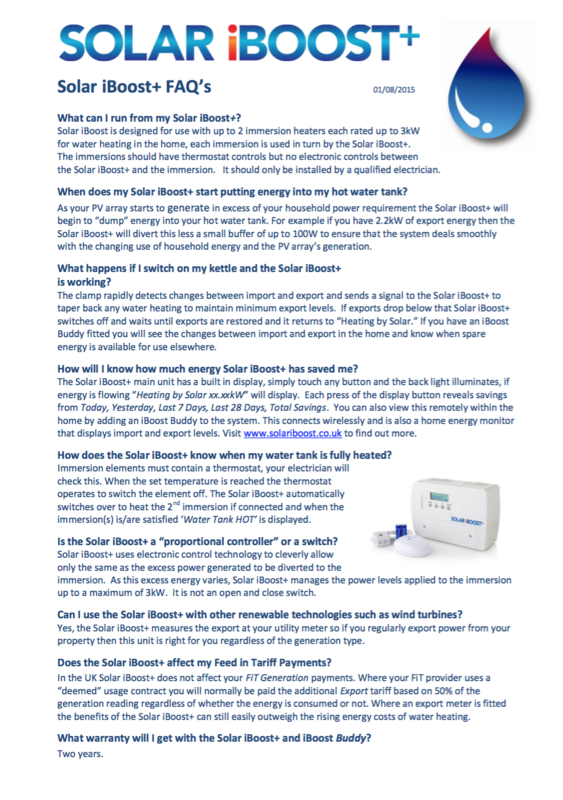 Use your Solar to give you FREE hot water! Hot water tends to account for 30% of an average power bill. The Solar iBoost concept is to use the surplus solar energy generated at your home to heat the water in your household water tank – and save you even more money. Solar iBoost uses ONLY energy that would otherwise be exporting, unlike some similar products, so you take the opportunity to use as much of the free energy that you are producing. Solar iBoost is quickly and neatly installed into your airing cupboard or beside your switchboard, simply wired between the existing fused spur and the immersion heater. 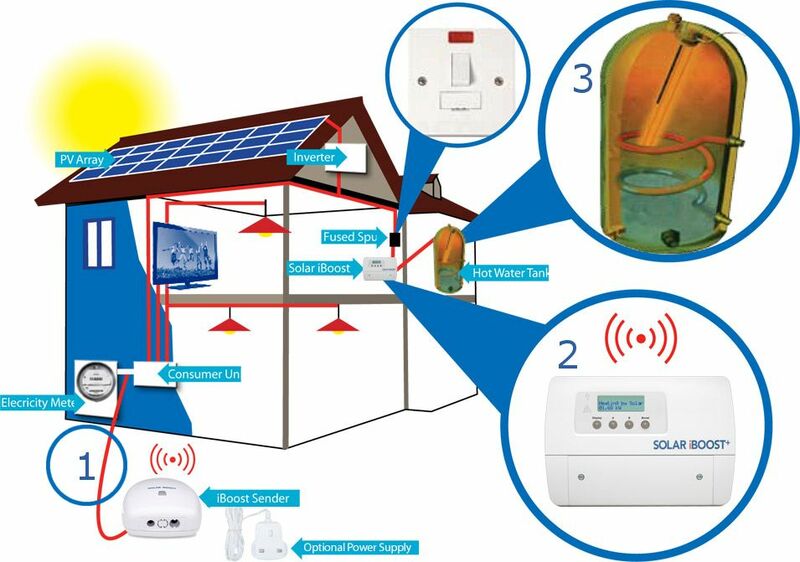 It wirelessly receives information continuously from a sender device which activates the Solar iBoost to start water heating. The sender is battery powered so it is rapidly installed with its clamp in the utility meter box and no need for expensive wiring. The Solar iBoost intelligently controls and adjusts the flow of energy to the immersion heater as your home consumption varies, ensuring that only excess power is used. There’s no need to change your immersion heater as Solar iBoost works with any normal household immersion rated up to 3kW. Solar iBoost displays real time and historical energy savings gures and LED symbols indicate the operating status. Simple timer programming enables Solar iBoost to work in harmony with Economy utility tariffs and a boost override switch means you can top up from the grid any time you need extra hot water. If you’re considering solar, or already have solar installed, have a chat to us about whether you’ll save more on your heating using Solar iBoost.